After a nearly four year hiatus following the failure of The Style Council’s venture into house music with 1989’s “Modernism: A New Decade” and the subsequent split of the band, Paul Weller returned after a rootless period in which he contemplated packing it all in. Weller had begun gigging again in 1992, with a totally new band, playing tiny venues and showcasing new material. 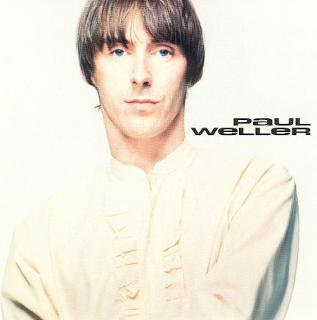 After the highly politicised light jazzy pop of The Style Council, it seemed Weller had spent four years listening to Traffic’s late 60s/early 70s catalogue along with other 60s R’n’B acts and he returned with a “rock” format, which although retrospective in many places, was also very much of its early 90s era - one of the forerunners of “BritPop”. Weller began to be known as “The Modfather” during this period, bestowing on him an “elder statesman” status that seemed slightly odd, as he had once ben dubbed “the spokesman for a generation”. The album is a good one. Full of nostalgic, bucolic lyrics inspired by a return to his home town of Woking and the beauty of the surrounding Surrey countryside. This was an artist wanting to show tht he had found a certain amount of inner peace, Van Morrison-style. 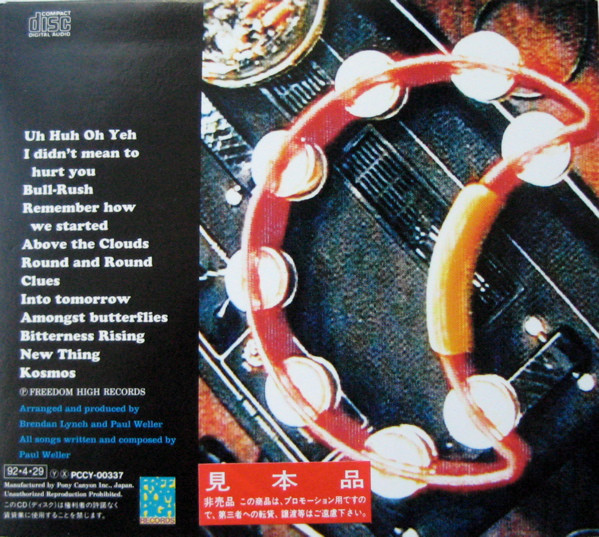 “Uh Huh Oh Yeh” has strong redolence of Traffic’s early 70s output with its bass/saxophone fade out. “I Didn’t Mean To Hurt You” has a Stax-style organ backing and a funky guitar and a soulful vocal delivery from Weller. It is far more soulful than anything produced by the (supposedly) soul-influenced Style Council. A lot of the lyrics are whimsical or “loved up”, far more of a personal nature than The Style Council’s railing at the political system. “Bull-Rush” exemplifies this - thoughtful, evocative lyrics and a laid back, dreamy, warm backing. Weller’s voice had never sounded better than this, either, losing some of its abrasiveness. Like Traffic, the flute is employed considerably on this track (and the whole album), along with some seriously funky guitar breaks. The fade out at the end is pure Beatles 1967 era. “Round and Round” is probably the most Style Council of the tracks - a light, melodic slow number with some sublime guitar breaks and some “late night” saxophone. It still finds time to launch into a “bridge” of Traffic-style funk rock though. The beguiling “Remember How We Started”, with its swirling organ breaks, and the beautiful white soul groove of “Above The Clouds” are both further examples of this new gentle, sensitive soul/rock. One could not imagine Weller doing anything other than sitting in his garden on a summer’s afternoon when one listens to this. I have always wondered why The Jam’s fist-pumping audience came along with Weller as he went on about “open top buses”, “flowers in bloom”, “butterflies” and “curtains in the sun” over a wittering flute backing, such as on “Clues”. However, they did, his audience was as loyal as it had ever been. Indeed, some seemed to return who maybe had veered off course during The Style Council years. “Into Tomorrow” is the most funk rock of the material, with an identifiable rock hook, but that sort of thing is few and far between amidst all the loved up reflection. “Amongst Butterflies” fits the latter description, but it has a seriously jazzy funk groove to it. Listening to this album no, one realises that it really is nothing like anything Paul Weller had done before, either in The Jam or The Style Council. “Butterflies” also had an extremely Traffic-influenced fade out. The conga part of “Strange Museum” is 100% Traffic too. Listening to this, having just heard “The Low Spark Of High Heeled Boys” and “Shoot Out At The Fantasy Factory”, the influences are clear. Weller keeps his tracks shorter, with more of a soul styling. Weller goes falsetto in places on this track too, in Curtis Mayfield style. The heaviest, funkiest tracks are the last two - “Bitterness Rising” and “Kosmos”. This type of sound would serve Weller well for several more years, although it would be merged with a more abrasive, rock guitar attack on later albums. What is notable is that this album not only appealed to Weller’s legions of fans dating back to The Jam period, but also brought along the new “millennial” generation with it too, who now respected the “grand old man”. He also found his music appealing to those who may not have liked the youthful anger of The Jam. Female teenagers only just born when The Jam started were now appreciating Weller’s music. No more was he just a “lad’s” artist. Quite what Weller made of this is not known, he was probably somewhat uncomfortable with it, but was more than happy to sell albums again.